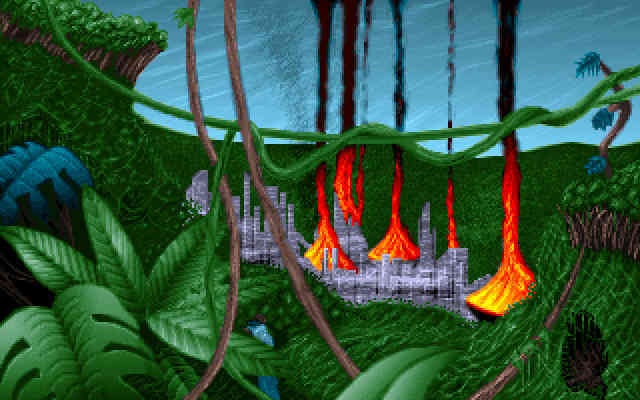 In Reunion, the player is able to mine- and build colonies on other planets, as well as interact with aliens. Reunion, aka Merit's Galactic Reunion, is a space strategy game developed by Amnesty Design (now Digital Reality). The game allows the player to build facilities such as housing, power plants, and even mining stations. It is also possible to build colonies on other planets, and to interact with alien races. Some of the main features which make the game stand out, is that you need to mine for resources. The resources, along with money, can be spend building different things in the game, such as satellite carriers, weapons and different ship types. You also have ground troops, which can be used to invade other planets. Another thing making the game stand out, is that it plays out in real time. Other games in the same genre are turn based, which I usually dislike. The main goal in the game is to find Earth, doing the process of finding earth, the player will transport resources, build colonies, and interact with different alien races. A fun aspect of the game is that you have to mine planets, and transfer resources. The micro management is fun in the beginning, but gets repetitive further in the game. Something less fun is that most battles in the game, besides those started by the player, seems to be scripted. You also can not prevent your first ally from being destroyed, even though you might want to. Unlike Master of Orion Reunion is not turn based, and I think this makes the game far more fun to play. The game does, however, have a few annoyances. One of these is the constant notifications about not enough living space, and need for hospitals on colonies. The player then has to build more to temporarily stop the message. However, at some point the planets will run out of space, preventing more from being build, and you will still get the messages. Therefor you might not want to build too many colonies. The game is very hard. You need to build a lot of hunters, fighters, and destroyers to be able to defend yourself against attacks. If you are unsure, chances are you need to build more. Not much to do than trial and error, and save often. Alien interaction is sadly limited. 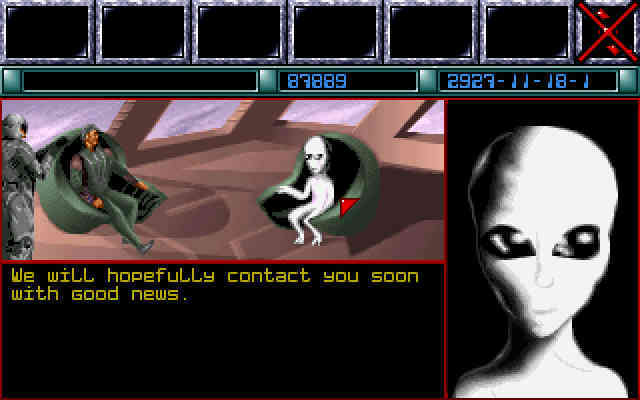 You will occasionally be contacted by aliens, and it is possible to make different deals with them. But you can not contact them back to negotiate. The dialog based interaction is similar to playing an adventure game, and it somewhat makes up for the limited interaction. It also makes trading feel less static than in other games, where the dialog tend to be very limited. The abandonware version of the game is plagued by bugs and crashes, so you should save often if using this! One of the errors, which seems to be specific to the abandonware version, suddenly shows that you have thousands or hundreds of satellite carriers. You can even move them around, which causes them become part of your fleet. If this happens, simply save the game without touching anything, exit, and re-load. I have no idea why this problem is happening, but it could be a problem specific to DosBox, as I do not remember it happening in native DOS. It also happens with colony ships in Master of Orion 2. Most the problems with crashes and game glitches do not exist in the original CD version, played in DosBox, so I think this is specific to the abandonware version. 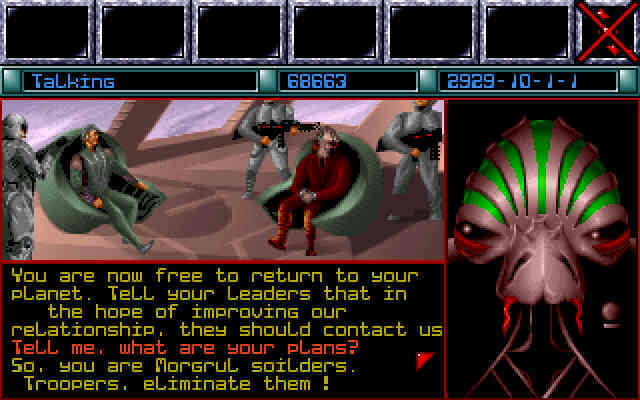 Master of Orion II is playable in DosBox, and is, as of 2017, still one of the better space strategy games.